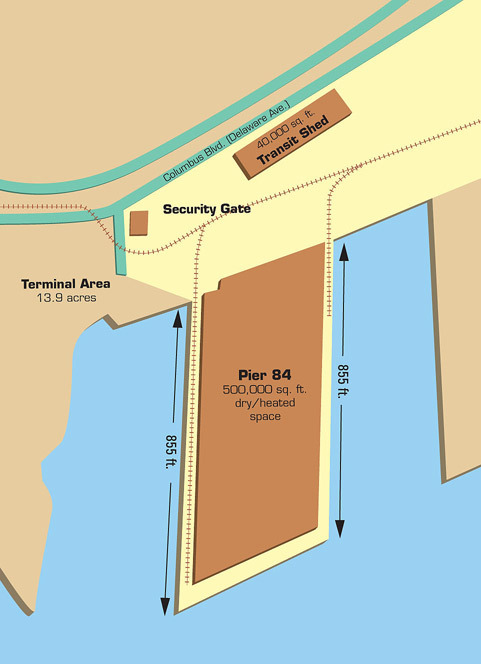 Pier 84 is the premier coca import facility in the USA. Beans arrive from equatorial regions around the world. Cocoa beans stored at Pier 84 are eventually transported to a chocolate or cocoa processing company. Pier 84 also provides value-added services such as weighing, grading and testing. Follow I-95 North to Exit 20, Columbus Blvd. /Washington Ave. Make a right at bottom of exit. Piers are approx. 1.2 miles on your left. Follow I-95 South to Exit 20, Columbus Blvd./Washington Ave. Make a right at bottom of exit. Piers are approx 1.3 miles on your left. Follow I-76 East to Exit 351, Packer Ave. Make a left at light (Packer Ave.), continue to end (Front Street). Make a left on Front Street. Continue 3 lights to Oregon Ave., Make a right. Follow Oregon Ave to Columbus Blvd. /Delaware Ave. Make Left, Piers are approx 1/4 mile on right. Follow I-76 West, Exit 351, and first exit after going through the Walt Whitman Bridge Toll. Make a left on Front Street. Make a right on Oregon Avenue. Follow Oregon Ave to Columbus Blvd./Delaware Ave. Make Left, Piers are approx 1/4 mile on right.